Today is yet another gloomy day out here in the wild west and I am starting to really miss some sun. I took these pictures right before it rained so I guess Mother Nature was looking after me there. OK so on to this outfit.. I've had this blazer forever and I really don't know why I haven't featured it on my blog yet.. but here it is in all its glory! I absolutely love it. I really cannot resist a good blazer...I have 14 and counting.. I'm not lying. When J. Crew finally opens in Edmonton I am not going to be able to resist getting one even though they are a tad over my budget. Honestly if I lived in the city I'd make it my goal to work there but unfortunately I live too far away! Also if you've been eying my Aldo wedges in store I highly suggest you go ahead and buy them because they are SO comfortable.. I want another pair! they make me feel like I have long legs! I will be moving some of our things into our new place (I'm excited).. but don't worry I'm not wearing my wedges! Your jacket is stunning!! Love the clean minimalistic look on you! I looove your look, specially blazer and pumps! 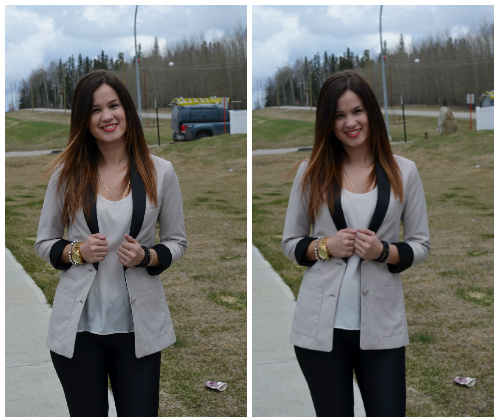 AWESOME blazer and wedges! J.Crew is honestly my kryptonite. They can do no wrong! I am loving those leggings on you! I've been considering buying them for a while, but I think I'd rather try them on before I take the plunge. This post definitely makes me want them more, though!